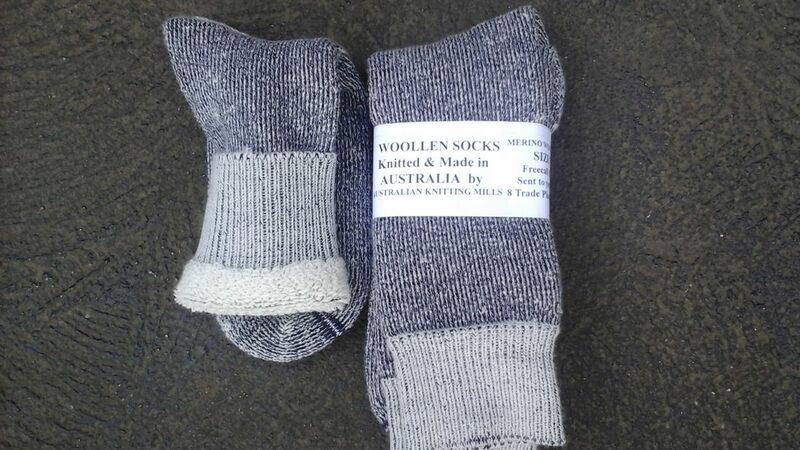 woollen socks-ultra thick. the best quality. 100% merino. Recommended and tested for hiking, buskwalking. loop pile interior. sponginess sole. normal price $25 . here $12.sizes 2-8 & 7-11. 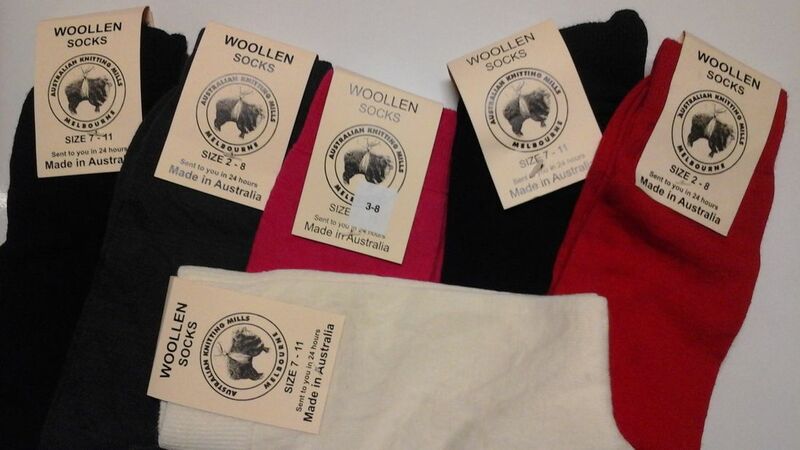 All our Footwarmers & Socks are Made in our factory in Coburg. Victoria , or associated Victorian Factories. The Footwarmers are made from Fine MERINO Wool bonded to a strong backing. Ideal for around the house, the nursing home or in bed. 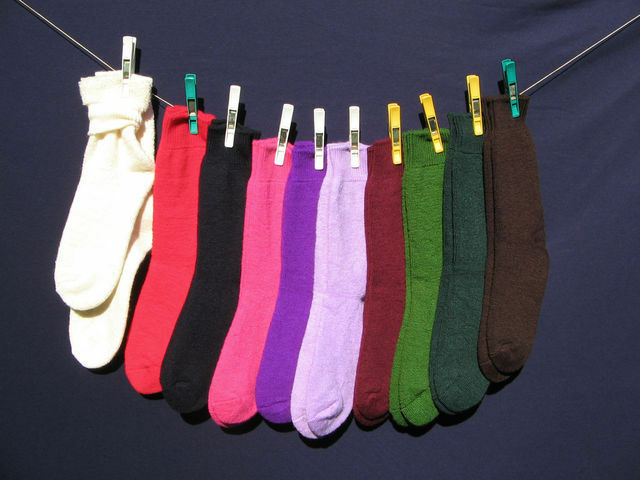 The socks are made from the highest quality PURE MERINO WOOL , or cotton. Coming soon...warm merino wool gloves, made in Australia, at our Coburg factory. woollen socks . "the best". Melbourne made. 90 % merino wool. 10 % nylon. hard wearing. pre shrunk. 8 colors . Soft terri inner. ideal work sock, hiking sock, ultra warmth. 2-8 small. large 7-11. Price $9.00. king size $11. woollen socks. "the best". 90% wool. 10% nylon. hard wearing. Melbourne made. pre shrunk. (not "Chinese). 10 colors. 3 sizes. terri inner. ideal hiking, warmth, soft sole comfort. 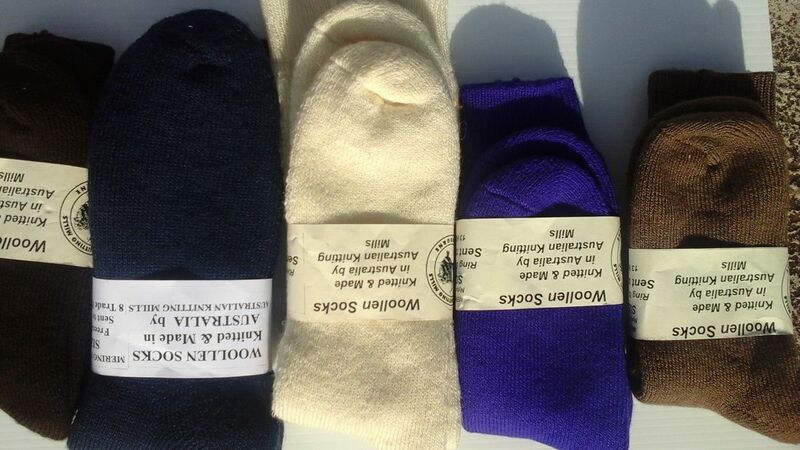 woollen100%.FINE WOOL, DRESS SOCKS. IN COLORS.HARD WEARING. BLACK .NAVY. RED. PINK.GREY NATURAL. IN SIZES 2TO8 SMALL SIZE AND 7TO 11 LARGE SIZE. HARD WEARING . 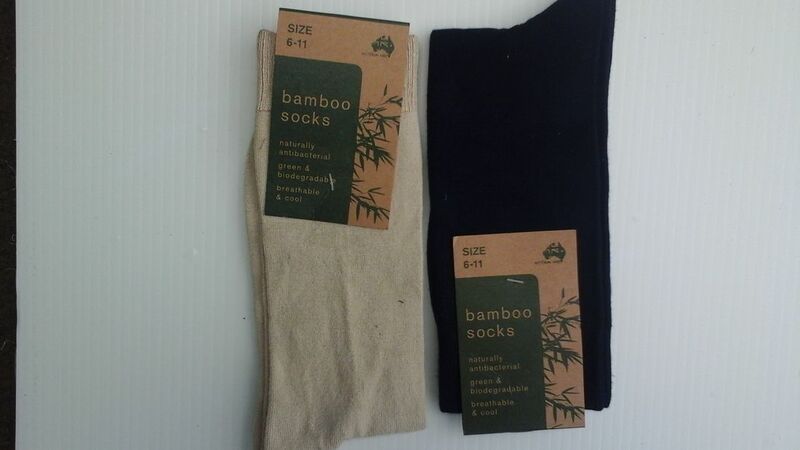 bamboo socks. fine knit dress socks. soft. bio degradable. breathable. colors -black.navy.cream.red. sizes -sm 2-8. Large-7-11. price $6 pr.